Well, I did as much cleaning and washing of clothes as I could cram in today with a break to meet friends for coffee and get groceries. It was a great day for line drying clothes provided they were clipped good enough to stay on the line. I spent some time auditioning a few fabrics to border my painting of the fishing shacks which I have now printed onto fabric. The colors came out really nice, but I'm not sure of the borders yet. 1. On a padded surface (I used a board with cotton batting stapled to it) pin a piece of washed cotton. 2. Mix 1 cp water with 1 cp flour until lump free. 3. Spread onto the cotton with a wallpaper squeegee. 4. Make marks with a bamboo skewer or anything else you can think of. 5, Let dry (at least a day) and lightly crackle. 6. 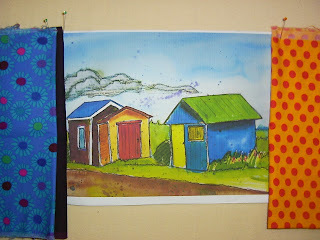 Paint with acrylic ink or textile paint in a dark color. 7. Let dry at least a week. 8. Soak and wash by hand, and then in the washing machine - no soap needed. 9. Dry in drier and iron. It could be darker: I believe that the paste was a little too thick. It will be fun to experiment with perhaps a lightly colored fabric with a dark color paint. You can just make out he flower design; I will be doing something with it eventually. This is one of 3 designs. a second one with trees is very nice too. It just didn't show up as well in the picture I took. Hubby and I are still in relaxation mode today. We had a leisurely breakfast, did a wash, and took a drive to the beach to visit his parents. His mother had a cold, but we visited long enough to show them a slide show on the laptop from our summer adventures. I made a healthier than usual version of macaroni and cheese for supper. I used low fat milk and less cheese in the sauce to which I added green and red peppers and mashed sweet potato. The sweet potato idea came from a magazine recipe where they added mashed squash. We had a side of yellow beans from the garden. It was delicious! Here is a photo of my little rough sketch that I did in the middle of our 25 km bike run up and down the roller coaster hills around Nictau Lake. I'm hoping that will excuse it's simplicity. Please don't look too closely! We just arrived home from our last camping trip of the year, as I head back to work Sept 8th. We had a great time at Mount Carlton where, as you can see in the pictures, we climbed to the top. 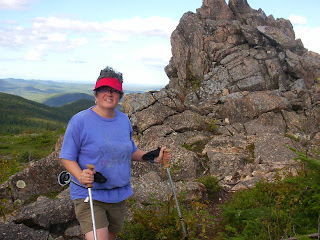 It is 825 meters above sea level which is the highest point in the Maritimes according to a little write up about it in the hut at at the top. We didn't stay long as it was very windy and cold at the top. Also, we started the hike at 3:15 and finished at 7:30, so we didn't want to be caught in the dark. 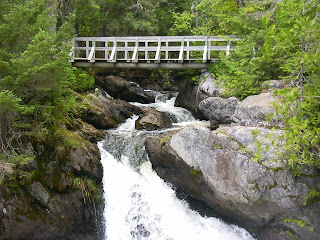 The next pictures is a picture of Williams Fall's. I took that near the end of a 25km bike trek around Nictau Lake. 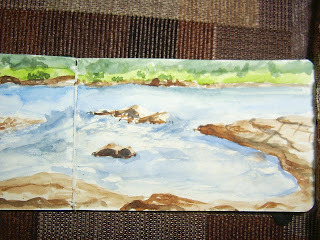 We stopped there for a little break, and I stayed long enough to do a small watercolor sketch. I have not yet put the finishing touches on it. I'm going now to take some time to soak and soothe some sore muscles. I just want to say that I will be going away again for a few days camping at Mount Carlton. I know we are supposed to get some rain tomorrow, but I'm hoping it will be intermittent enough to get our tent trailer set up. We are taking our kayaks, our bikes, and hiking poles. Do you think we'll have enough to do? Also, I will bring the camera, my sketch book and some knitting. I'd hate to have a moment with nothing to do! Hopefully I'll have some pictures to share when I get back later this weekend. We had such a great overnight trip to visit my daughter. We made it to Tree Go; even though thundershowers were forecast, it did did not. I don't know how many of these exist - there are two here in NB. If you look it up on the net you will see pictures and video clips of what it is like. We were given a small lesson on the harnesses, the safety clips, and ran through a demo course first. I was nervous because of my fear of heights, but that didn't bother me at all. 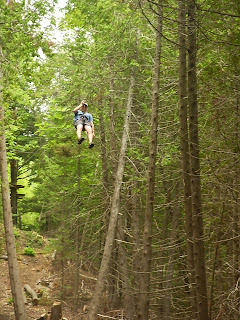 Once we got up in the trees and I had to walk those tightropes and planks, I was totally absorbed in just hanging on. It was a real challenge, but it was fun. The weather was horrendously hot and humid and we were all dripping in sweat by the finish. I opted to stop at the halfway point and my husband and daughter finished. I really wanted to go on as there were several more zip lines and over water, which I surprisingly found to be the most fun. However, it takes a lot of upper body strength and I was getting tired. The halfway point is the only place you can opt to stop; once you continue there is no way down except to be rescued, and I sure didn't want that to happen! I got one picture of my husband on the zipline at the finish. Today I am trying to soothe my aching muscles, and playing a bit in my sewing room. The next picture is a painting on watercolor paper which I just finished free motion stitching with black thread. I am next going to scan it to my computer and then print it out onto fabric. I will embellish it from there. This procedure is demonstrated by Kelli Perkins in the Sept/Oct issue of Cloth Paper scissors, and in one of the Quilting Arts workshops on DVD. I think I will lighten the clouds a little before I scan it. 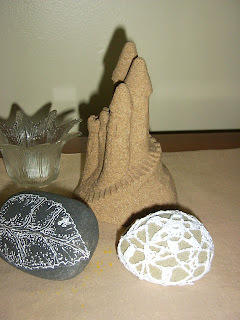 The last picture is of a beach rock collected from one of my walks on the beach at Grand Anse. I crocheted a cover for it after seeing it done on the blog Resurrection Fern. The author has an article in a fall crochet magazine which I haven't found so I tried one on my own. It's not as nice as hers but I like it anyway. 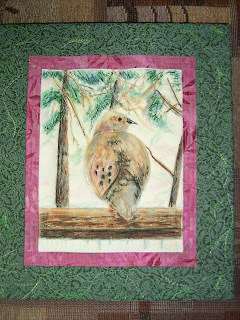 I finished putting together the top for this wall hanging by Mount Redoubt Designs -Letitia Hutchings. I'm doing it for my mother for Christmas and I wanted to get msot of it done since I start back to work in a couple weeks. 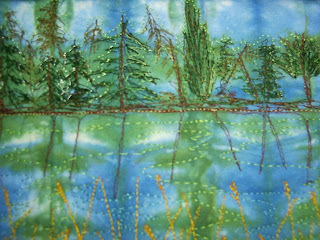 Today I've also been running around gathering up my wall hangings to send them to Kennebecasis for the show. here is a picture of my latest one. I used a foam stamp and fabric paint to start, then pieced it, did some painting, some free motion quilting and then added lots of hand embroidery. Oh, and I discovered when I went to the gallery in town that the small hanging that is pictured to the right called La Tulipe has sold. I'm happy. 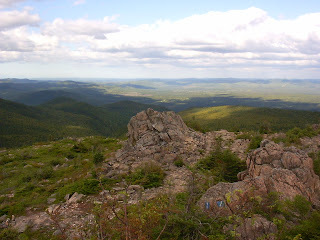 I'm off tomorrrow for another overnight trip - this time to Fredericton to visit my daughter. we'll be back before the bad weather from the hurricane hits. Thanks to a commenter for the advise on where to find a tutorial on making a header for your blog ( a Stitch in Time). I have read it but I am still unable to make any changes because I think I need a photo software to make changes to my photos first. I don't have the software right now but I'm hoping to get some in the near future. The weather here is still unbearably hot and humid, and I am just in a sweat all day. I feel sleepy and woozy, so I'm not accomplishing much. However I am doing some little things like sewing labels to the back of some wall hangings to get them ready for the show in Saint John in September. 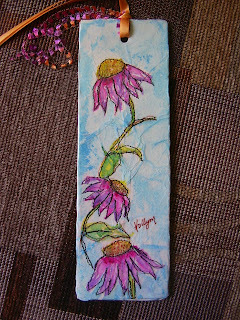 Also, here is a photo of a bookmark that I just made for a friend. I glued tissue paper to watercolor paper, painted it with watercolors and then free motion stitched it with black thread. We had a quick but lovely trip over the weekend to Prince Edward Island for my brother's wedding. It was a small and short service with a dinner afterward at Glasgow Hills golf course. Thank goodness because it was 32 degrees without the humid ex factored in. It was nice though to see the family, some of whom I haven't seen in years. Later around 8 pm my husband and I drove the 30 minutes to spend the night at my mother's cottage. We had the place to ourselves and we went went for a lovely swim under the stars. It dawned another beautiful on Sunday, so we spent a few hours walking the beach and swimming before leaving for home. On the way home I stopped at Chapter's in Moncton and I purchased the book How to Draw and Paint Fairyland by Linda Ravenscroft and I'm absolutely enthralled. The picture above is of a pen drawing that I did on a beach stone last night while watching Merlin. I just can't sit still and it was too hot ot knit! I don't have any new pics this morning. It was too hot to do anything yesterday, and today my husband took the day off, so we're going to the beach with our kayaks. 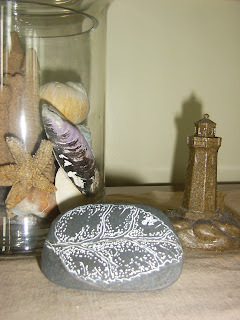 Tomorrow we're going to PEI for a family wedding - back on Sunday. I am posting a picture today of a small project that I started a couple years ago. It is one of a few UFO's that I am committing to finish before starting some new work. There are some areas of pulling where I over did the free motion stitching which is why I opted to try stretching it on stretcher bars. It is still not perfect but done at least. I think I may put a small bead in the eye though as I think it needs a spec of white. 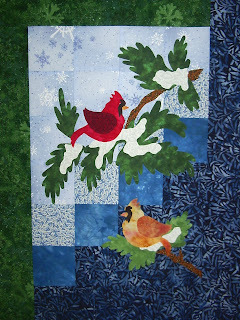 I am going to send it off the to Kennebecasis Quilt Show in September. I'm not doing much today. It's a beautiful day though. I did my little bit of housework early - hung out the sheets, did a small wall paint patch job, and then I went to a beginner yoga with a friend. It was good - very relaxing, but I am more sore now than when I started. It'll take time. I had already decided to relax today. 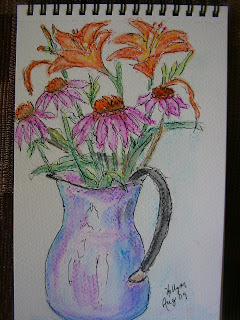 I had picked this vase of flowers the other day and I just did a quick watercolor crayon sketch of them. I did in my 5" by 7" book and therefore ended up squeezing in the lilies, so the scale is a little off. I am trying as yet to stay away from painting actual size, as I start to feel it must be realistic and I freeze up. I may be ready to go a little larger than the small moleskines and sketchbooks I've been using, but I am still trying to stay 'sketchy'. I want to stay away from realism. I get caught up in how something should look. 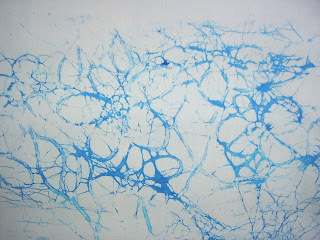 when I look at the artwork of others, and I really like something, It is usually more abstract with colors and textures. I would like to work towards that. Yesterday was my husbands only day off this weekend so I spent it with him. We went kayaking up the Nepisiquit River where we stopped for lunch and later on the way back we had a swim. It was a lovely few hours. 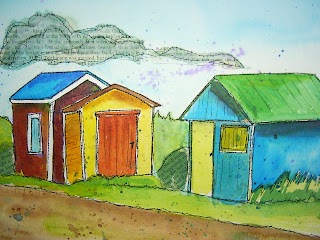 The only picture I have to post is a very crude watercolor sketch I did while stopped for lunch. 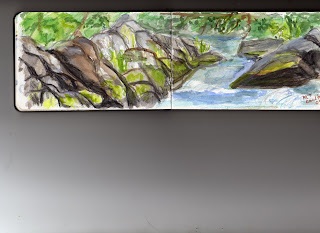 It is challenging to use the medium while outside on a windy day. Also, I had only the tiny brush that comes in the kit. Those are my excuses anyway. I am trying to urge myself to do a little artwork every day. In order to enjoy it I must learn to not be so critical with myself which means "just doing it" and then throwing it out there no matter how good or bad I think it is. The reason I left my art for sometime was that I was too uptight about the finished product. Now I am trying to concentrate on the process, so I may have more of that kind of photo here than finished product. In another vein, on Saturday, I took two pieces of fabric and buried them in my backyard. I was inspired by another artist that I read about who does that as well. (Cas Holmes). Last night while sitting on our deck, my husband and I were enjoying the songs and antics of all the birds. Sometime later, he noticed a movement under the hedge. It was a cedar waxwing that seemed to be in trouble. We watched for soemtime as it struggled and then slowed down. It had dug itself into a little hole right next to my fabric. That was really not what I had in mind when I came up with my name 'nature art'! I shall have to check it out when the rain stops and move it to a better burial spot if it is still there. Sad. The following is a link to the Two Creative Studios newsletter page where you can sign up for news on classes and updates. They are also doing a wonderful giveaway just for signing up for the newsletter. Check it out. I bicycled to the market this morning which is all downhill from my house and took about 1/2 an hour. I loaded up my saddle bags with fresh blueberries, yellow beans and mussels to make the trip home. The wind came up and it was of course all uphill, so I got quite the workout! I had a little food and rest, and I went out into my yard to cut some flowers for a bouquet and for pressing. I would like to do some sun prints later in the week. The first picture I'm including today is the front cover of a little watercolor paper book that I made to carry around with me this summer. I filled 1/4 of it when I went to visit my son in Lunenburg, NS. 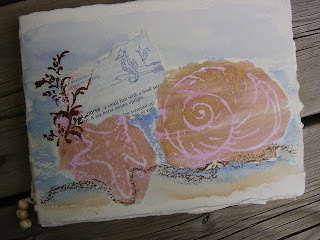 The seashell and the starfish are collaged from a paper that I stamped with a handmade stamp, loaded with acrylic paint. Then once that dried I painted over that with pink watercolor paint. This method is described in the spring 2006 issue of Cloth Paper Scissors in the article by Moira Ackers. The second photo is of a doodle that I did last night while watching TV. I got the idea for my doodles from the web. 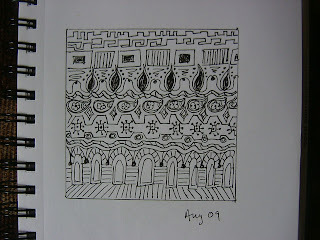 Try searching under zentangle. Last night my youngest son had a car accident that involved a trip to the hospital in an ambulance. He is fine (unlike the car), though he will be sore. The air bag did not deploy. I am waiting for news today, as he had just started a new job this week. 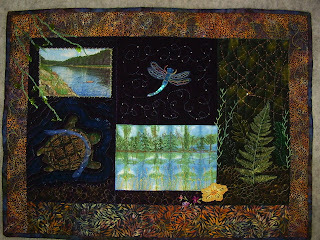 I have added a picture of my latest wall hanging- though I have been working on it for some time- it is finally almost finished. the binding is all ready to go on. 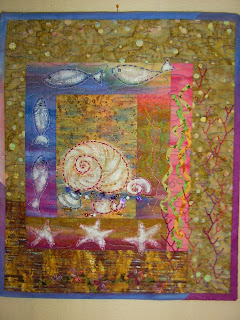 The theme is 'On the River"and, I started by making stamps, and stamping on cotton velvet. I pieced those bits together with a fabric that I had hand dyed in a workshop. Then I did some thread painting and finally some hand embroidery. I will post a picture of the whole once the binding is on. The weather has been so humid lately that I have had a hard time to rouse myself from my lethargy to do anything. 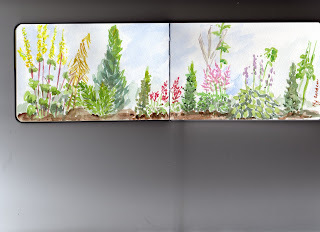 However, last evening, there was a pleasant breeze blowing, so I sat in my backyard and did this little watercolor sketch of the back garden.